where there are many possibilities, and one way to reach synergy is by making decisions that invite it into your experience. A large part of living is about becoming aware of our possibilities. By becoming aware of your possibilities, you increase your access to synergy and become powerful and free. Our thoughts are like sunglasses we never take off. They have the power to darken our view or make the colors of the world seem richer and deeper. 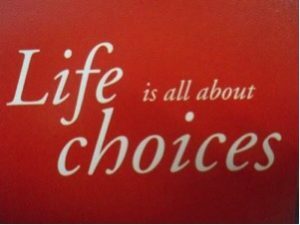 It all depends on what we choose. The fact is, you can choose from a menu of options, choosing to be joyful rather than angry or hopeful rather than disappointed. Choosing healthy happy thoughts takes practice and dedication, but the benefits start as soon as you do, because those healthy thoughts influence your behavior, the situations you create in your life, and the kind of people you attract. The way to success in any realm (interpersonal, financial, or spiritual) involves the focused application of hope. By hope, it means to sustain a deep knowing that something good is happening right now. On the other hand, when you have negative thoughts or expectations, when you find yourself assuming the worst, stop immediately and replace the negative picture in your mind with something positive. Therefore; allow yourself to practice in choosing good thoughts that serve you and help you manifest a joyful and happy life. Where your attention goes, energy flows. It is your choice at any given moment. Source: “CREATING EXTRAORDINARY JOY” by Chris Alexander.